USP Creative has completed a challenge set by Philips Healthcare to make a new CT Scanner more appealing to younger patients. The first machine has been installed in Alder Hey and the graphics have been designed to act as distraction therapy for children while the scanner is being used, so they don’t feel as intimidated and overwhelmed by the process. “The way in which the CT Scanner has been received by staff, patients and Philips is very exciting for us. We are strong believers in the positive benefits of environmental graphics and this project demonstrates the versatility of the medium,” said Jan Peters, MD of USP Creative. 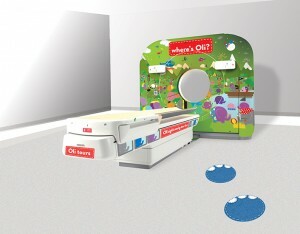 The Liverpool agency came up with the idea of using Alder Hey’s brand mascot Oli and placing him in a scene with his friends. Once children arrive at the scanner, they are given a checklist, asking them to find various characters. “The ‘Where’s Oli?’ graphics have taken away the clinical feel of the room, making it much more child friendly and less intimidating to our patients. It gives the child something interesting to focus on and distracts them from the procedures taking place. The application is also easy to clean and maintain as well as being hygienic,” said Gillian Hughes, superintendent radiographer at Alder Hey. The theory is that if children are less stressed about the scan, they don’t move around as much. This means firstly that they don’t need as much sedation and secondly that the scan is likely to be clearer. USP Creative initially developed the Oli brand in 2012.